WASHINGTON – An emergency Trump administration plan to tap storm protection funds to pay for a border wall was slammed Friday by Houston lawmakers who said it could endanger the city’s recovery from Hurricane Harvey and jeopardize the region’s preparedness for future storms. $295 million for Clear Creek – includes 20.4 miles of channel improvements along Clear Creek, Mud Gully, Turkey Creek and Mary’s Creek as well as new stormwater detention along Clear Creek and a detention basin along Mary’s Creek. 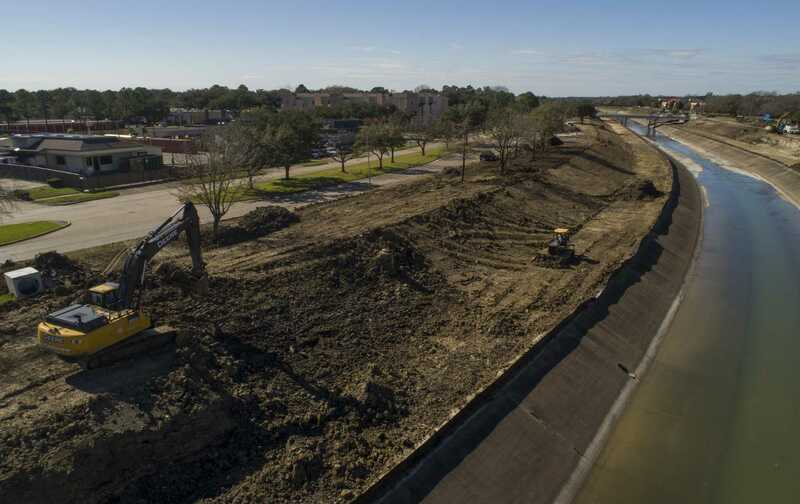 $75 million for Brays Bayou – includes ongoing channel modifications upstream of South Rice Avenue, three ongoing bridge replacements or repairs and eight future bridge replacements or modifications. $65 million for Hunting Bayou – includes 2.4 miles of channel modifications upstream of Hempstead Road detention basin, modifications to three bridges at the Englewood Railroad Yard and 0.5 miles of channel modifications downstream of Liberty Road. Confusion still reigned in Congress Friday about the president’s intentions. While Democrats raised alarms about losing flood control and other disaster recovery funds in Texas, Puerto Rico and other storm-hit zones, Republicans sought to minimize those concerns – at least in Texas. Some regional officials also have expressed concern about future of Army Corps funds for the long-sought “Ike Dike” – a 70-mile-long coastal barrier to protect the coastline around Galveston Bay against storm surges. The most recent version of the plan – now under study – carries a price tag of as much as $31 billion. A spokeswoman for U.S. Rep. Randy Weber, a Republican whose district extends to Galveston, said the impact of the president’s plan remains uncertain. “With the fluid nature of things, we can’t speak to the hypothetical situation in which Army Corps funds would be used,” said the spokeswoman, Emma Polefko. Whether or not Trump goes through with some type of emergency plan to fund the wall – a move that Democrats have vowed to fight in court – the prospect of taking storm protection monies has renewed criticism of the administration’s response to Hurricane Harvey.